Tannoy reveals Eclipse and Mercury 7 budget speaker ranges | What Hi-Fi? The two new speaker ranges will be given an official UK launch at the Bristol Show in 2016 but they should be in shops by the end of this year. The Tannoy Eclipse is the new entry-level speaker range from the Scottish company, and features a bookshelf speaker, the Eclipse One, and two floorstanders, the Eclipse Two and Eclipse Three. Prices for the Eclipse speakers will start at just £129 and rise to £299 for the largest floorstander. The speakers sport new drivers, which aim to partner "the smoothness and accuracy of a coated silk dome tweeter with the attack and punch of Tannoy’s renowned high-efficiency mid/bass drivers". All the Eclipse cabinets are ported and the Eclipse Two and Three floorstanders (pictured, above) come with integrated plinths in an effort to deliver extra stability. 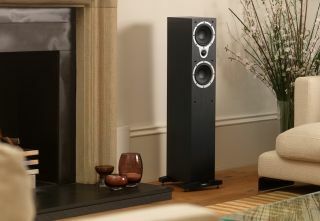 Tannoy's Mercury range (pictured, above), previously the most affordable Tannoy speaker range, is also getting a revamp. The Mercury 7 speakers promise improved performance thanks to upgraded drivers and new cabinets and crossovers. The range will also be available in a wider range of finishes. There are four speakers in the new range: the Mercury 7.1 and 7.2 bookshelf speakers, the 7.4 floorstander and the 7C centre channel. £179 is the starting price for the Mercury 7.1 speakers, rising to £499 for the Mercury 7.4. All the speakers come in black oak, light oak and walnut. You'll be able to see and hear the new Tannoy speakers at the Bristol Show 2016, which runs from 26th to 28th February.